This small, elegantly-proportioned, tear-shaped flask is of solid silver and is a rare example of a relatively early northern Indian silver perfume bottle. Its walls are thick and consequently, the flask or bottle is heavy for its size. 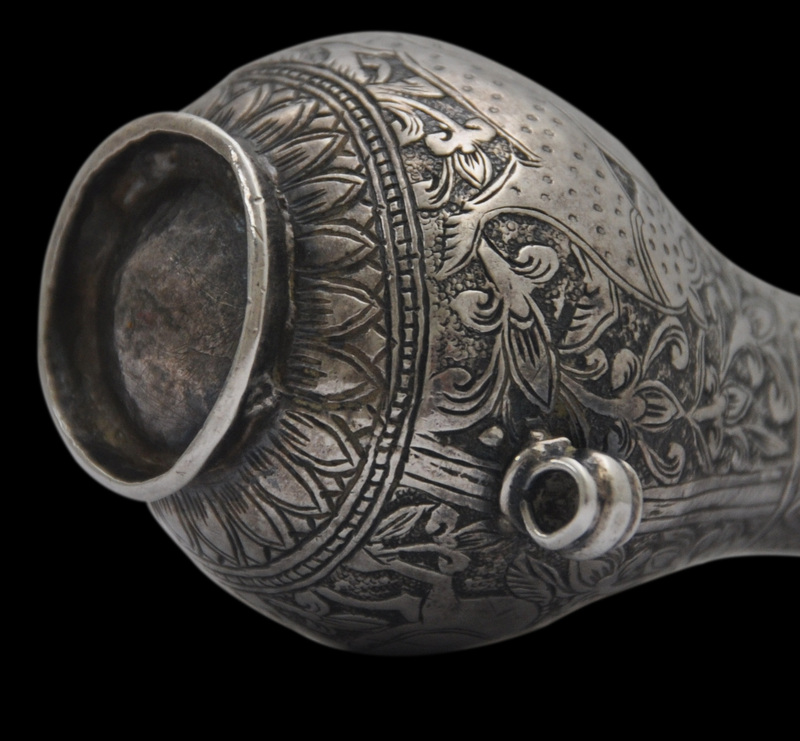 Originally conceived as a perfume bottle, is likely to have travelled to the Middle East, perhaps to Oman, where it was re-purposed as a kohl container. It is there that the stopper and two lugs or eyelets attached to the side were added. The bottle is engraved all over. The lower register is engraved with a border of lotus petals. The upper section has a broad border of elongated petal motifs. 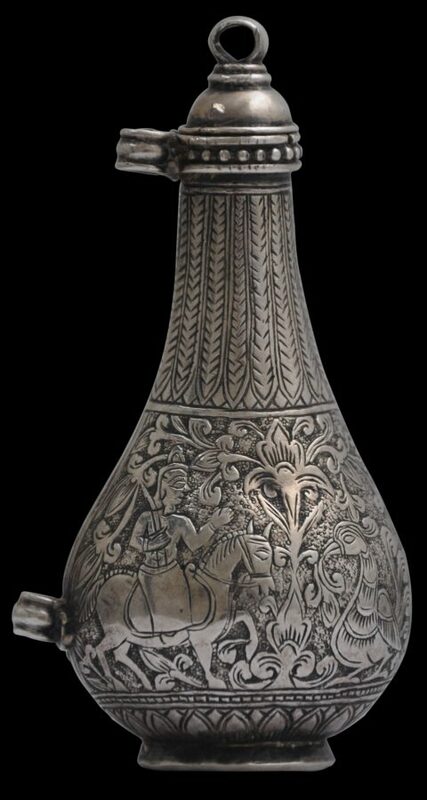 The central panel is decorated in one continuous scene which wraps right around the bottle and includes a rider on horseback, a sacred goose (hamsa) and a Persian-influenced Mughal hunter/prey scene with what is likely to be a leopard or dog attacking a deer. The bottle sits on a low, flared, ring foot. In Hindu culture, the sacred goose is the vahana for Brahma and also Brahma’s consort, Saraswati. The symbol of the hamsa transferred across to classical Buddhist art, and so appears in Sri Lankan, Burmese and Thai art for example. 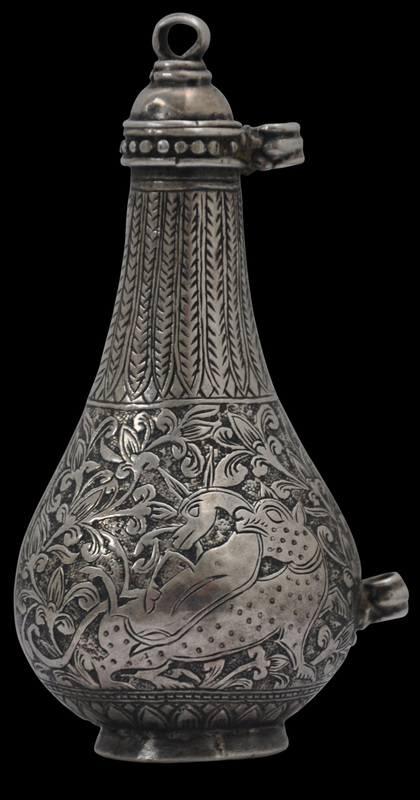 It also is sometimes represented in items destined for the north Indian/Mughal and Deccan markets. The bottle is in fine condition and has a smooth, lustrous patina. Bjaaland Welch, P., ‘The wild goose in classical Buddhist art’, Arts of Asia, January-February 2014.